With over 30 years North American big and small game experience you can be sure your job will be handled with care and detail. The FULL DRESSED ATLANTIC SALMON FLIES OFFERED BY FEATHER RIVER ANGLER'S WORKSHOP are all tied using primarily game bird feathers. When exotic feathers are used, all feathers are legally obtained. 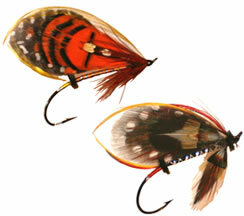 Most flies are tied on #1.5 and #2 size salmon hooks and every fly is framed for display.